As I grow older, I notice my clothes are shrinking and I am tempted to forget about praying for peace in the world, in my relationships and my own country. That said, through the grace of God and with thinking that is magical but realistic, I have discovered the way for us to experience the peace and serenity we desire. The way to peace requires people to have fun, dance and laugh at the same time, on the same day, once a week. Every human being over 6 years old should dance (as if no one is watching), tell jokes and have fun with as many people as possible for one hour. This activity, I suggest, could contribute to world and inner peace. Can you imagine people from Russia, Asia, Africa, the Middle East, Europe and the Americas getting together with neighbors and friends every week for one hour of play, to tell jokes and dance with others — to defy gravity by jumping for joy like an athlete who just performed a super-human achievement? Can you picture people leaping in the air to celebrate their ability to let go of frustrations, the stress of competition and feelings of superiority or inferiority? Of course, we still need prayer and patience to experience peace, but fun, dance and laughter provide good medicine for our tired souls. Hear any good jokes lately? Had any fun lately? When was the last time you laughed? Msgr. 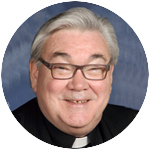 Joseph M. Corley is pastor of Blessed Virgin Mary Parish, Darby.